In June of 1995 Tim delivered in excess of one million signatures, for “Voluntary school prayer and Bible reading,” to the U.S. Congress commanding the attention of then, U.S. House Speaker, Newt Gingrich and other high ranking government officials. Tim continues to be used on a national level to restore religious freedoms to America. In the United States we claim to believe in God and in fact proclaim our trust in Him on every piece of our coins and currency. Many of our laws are based on the Ten Commandments, and even in the crown molding that adorns the principal chamber of the U.S. Supreme Court, Moses and the tablets containing the Ten Commandments are depicted. Yet we take great pains to delete references to God and the Bible from all public spaces, especially our public schools and municipal buildings. We seem to be having a difficult time determining whether we actually believe in God or whether it is something that we have gotten used to saying in a pro forma manner without actually thinking about our words. Did you know that the words, UNDER GOD, were not actually in the original version of the Pledge of Allegiance to the flag? They were added later to make people aware of the importance of God in every aspect of our lives. I’ll be the first to admit that the acknowledgement of God in virtually everything we do does not show a great deal of respect for atheist and others who do not have traditional views of God, but as the Bible says, you cannot serve both God and man. This doesn’t mean we should try to force others to believe what we believe. However, it does mean that we have to make a conscious choice as to what we believe and form our societal values surrounding those choices. Who says what is right and what is wrong? For a nation to be united, the majority of its people have to agree on the answers to these questions, or at least agree that there are answers to be found. For years, the majority of American’s have turned to a belief in God and the Bible for answers. From the creation story to the Ten Commandments to the Gospels to the Epistles, the Bible provided an explanation for the meaning of life and instructed us in moral principles. We held to a Christian standard while respecting the beliefs of those who didn’t share them, and that standard saved us from confusion. Today, fewer people believe in the Word of God, or even in absolute truth, and our rejection of an objective moral standard has thrown our nation into disorganization. If we really believe in God, a lot of the “moral gray” issues become black and white. The devil is determined to destroy a generation of young people in America by distorting their view of moral absolutes. This is why the distribution of the Truth for Youth Bible to young people is a priority for the ministry that God has call me to. As most of you know, the Truth for Youth consists of the entire New Testament along with powerful comic stories that deal with the truth about issues of moral concern. Click the photo to purchase or help us provide Truth for Youth Bibles. For example, the theory of evolution is a form of religion. In this belief system only the strong survive and there are no moral implications connected to the actions necessary to survive and be productive. It is actually harder for an evolutionist to describe the basis of morality than it would be for a creationist. With regard to abortion, according to God’s Word, life begins at conception, not at time of delivery. In Psalm 139:13-16 God new the writer of these verses while he was still unformed. God knew Jeremiah before he was born and had a special destiny for his life, Jeremiah 1:4-5. I hear people say, “A woman should have the right to choose.” Hear me, no woman should have the right to choose to murder a child in her womb! God loves the homosexual but He hates the sin of homosexuality! He loves everyone regardless of their behavior. Jesus died to pay the price for their sins too. This doesn’t mean that we have to accept man-imposed changes to God’s Word. We all make choices in life. With regard to homosexuality, one can choose God’s Word or the homosexual lifestyle agenda. Standing up for traditional marriage and family does not make you a homophobe!!! By no means does choosing God mean that we need to be unkind to non-Christians. It is in opposition to the American way to try to shove our beliefs down someone’s throat. On the same token, it is absolutely unreasonable for atheists to try to make Christians be quiet! The persistent attempts by some atheists to have the words UNDER GOD removed from our pledge or the phrase IN GOD WE TRUST removed from our money is wearisome. America was built on a foundation where religious freedom and freedom of worship are guaranteed. Click the photo to help us provide Bibles for our troops defending America in the war on terror. America has had many manifestations of God’s mercy and favor throughout history. In August of 1776, General George Washington and eight thousand soldiers were trapped on Long Island with British General Howe getting ready to defeat them the next morning. The island was surrounded by the British armada. Desperately, Washington drafted every sea worthy vessel available, from fishing boats to rowboats, in an attempt to ferry his army across the East River all through the night. At the break of dawn, many of his soldiers were still in eminent danger by their exposure to the huge British fleet. However, most curiously, theft that usually would rise from the water once the sun came up, didn’t budge. It remained dark long enough for all of Washington’s men to escape to safety. This had been the British’s most opportune time to secure a win over the U.S. Army. Very similar to the children of Israel in the Word of God, America has moved away from our strong belief in God and many people don’t even know what they believe anymore. Church attendance is steadily declining, especially among the younger generation; traditional families made up of one man and one woman, and their children, are quickly becoming extinct; and the things that God says is wrong are being embraced. Throughout history, once a country begins this path of a lack of identity and vision for the future, it is devastated, or crumbles from the inside out, losing most or all of its relevance to the rest of the globe. YES BROTHER TODD, I WANT TO HELP YOU MAKE AN ETERNAL, SPIRITUAL IMPACT IN THE LIVES OF THOUSANDS OF PEOPLE OF CUBA! 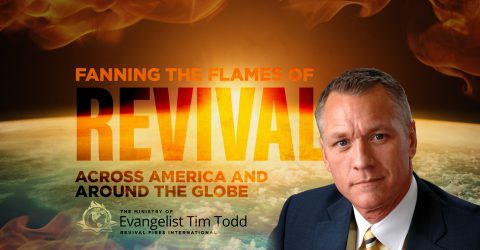 YES BROTHER TODD, I WANT TO HELP REVIVAL FIRES PUT A BIBLE INTO THE HANDS OF EVERY U.S. SERVICE MAN AND WOMAN DEFENDING AMERICA IN THE WAR ON TERROR. It has been promised and God cannot lie! In Ezekiel 36 it says that the world is going to watch in amazement as God revives His bride to be. We are witnessing this in our revival services as we travel across America and around the world. It is His work, not ours, and the world KNOWS it is God’s hand and God gets all the glory! God promised in Ezekiel 36:33 to restore us to our first glory, as in the, book of Acts, and the transformation will be like changing a desolate place into the Garden of Eden. Click the photo to help us provide Bibles for the people in the Communist country of Cuba. Church it is time to WAKE UP and step into the fullness of what God desires to accomplish. God weeps over the complacency of the church. We go out of our way to explain why we are constantly willfully sinning, knowing even before we sin that we will simply confess it again for forgiveness, even though the Word plainly tells us that if we do this, there remains no more sacrifice for sin, but a fearful looking for judgment. Brokenness is the first step. He who loves his life will lose it. It is no longer our life, but His. We must see that to truly walk the Christian walk, it is a radical giving of ourselves to do his will on earth, not our will. No longer can we preach a Christianity that costs nothing. Count the cost. Jesus said, it will cost you your life to follow him. He who loves his life will lose it, but he who loses His life for my sake will find it unto eternal life. We are witnessing the miracle of the church being restored with power, unity, joy, love, and above all the manifest presence of the Lord. The world is looking on and marveling like they did in the book of Acts. The world will be drawn to us or they will stay out of our way. Let’s cast the net and bring those that God is drawing by His Spirit, to the saving knowledge of Jesus Christ. Please pray for the upcoming revival services and upcoming crusades God has assigned us to! Commemorative Edition 16X20 full color picture of the very ‘First Prayer in Congress’. Also the names of those in the picture and the picture history are included along with a copy of the actual prayer that was prayed by Rev. Duche. Yours for a donation of $100 or more to help Revival Fires provide Bibles for our troops defending America in the war on terror-or-to provide Truth for Youth Bibles for young people in America’s public schools -or- to provide Bibles for Cuban people. Categories: Revival Fires Blogspot . . Author: revivalfires . Comments: Comments Off on ARE WE STILL ONE NATION UNDER GOD?